How do you measure who is the biggest quick service restaurant chain in the world? By the number of units, average unit sales, or total system volume? The two out of three that really matter—average unit sales and total system volume—clearly go to McDonald’s. In the most recent data available, while Subway had the lead over McDonald’s in number units of operating worldwide (37,000 to 35,000), the average unit sales in the United States for McDonald’s was over $2,500,000 while a Subway was a bit less than $500,000. It’s unlikely that Subway will be catching up with McDonald’s anytime soon. Ray Kroc obtained the right to franchise McDonald’s in 1955 and by the end of 1959, McDonald's had exceeded 100 locations in the chain. Ray Kroc bought out the McDonald brothers in 1961 and by 1965, when the chain had grown to 1,000 locations, McDonald’s went public. The stock opened that day at 22½, closed the day at 30, and closed the first month at 50. Today there are over 35,000 restaurants in more than 100 countries. McDonald’s and its more than 3,000 operators employ close to 2,000,000 people worldwide. Did you know that the Big Mac, Filet-O-Fish, and Egg McMuffin were all developed by McDonald’s franchisees? McDonald’s is still accepting applications to become a franchisee, but while there will always be room for new restaurants, in the United States most franchisees will enter the system by purchasing an existing restaurant either directly from McDonald’s or from an existing franchisee. Approximately 80% of McDonald’s restaurants are owned and operated by its franchisees. You will not be informed of what restaurants in the chain are available for purchase or the asking price for the restaurant until after you successfully complete your training and are approved by McDonald’s to become a franchisee. You will require $750,000 of non-borrowed personal resources in order to be considered for a McDonald’s franchise. If you are one of the few who is able to start your McDonald’s from scratch, you will pay an initial franchise fee of $45,000 and be granted a single term of 20 years. While most McDonald’s franchisees are offered successor agreements, your agreement with McDonald’s will only be for one term without renewals. Your continuing royalty will be 4% of your month’s sales. McDonald’s will generally own the real estate your restaurant will be built on, and will also charge you a percentage (you can anticipate a minimum of 8.5%) based on your monthly sales. Depending on the size of your location and where it is located, you can expect your initial investment in developing a McDonald’s restaurant to range between $955,708 to $2,290,146. 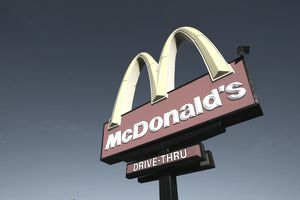 McDonald’s is different from many franchise opportunities today that are actively seeking investors to own franchises, as McDonald’s requires each of their franchisees to be actively involved in the day-to-day management of their businesses. McDonald’s is not a passive investment opportunity. If you are purchasing an existing restaurant, McDonald’s will require that you pay the seller a minimum of 25% as a down payment, and that payment must not come from debt—think cash. You will be allowed to finance the balance of your purchase price, but your loan can only be for seven years or less. While McDonald’s does not participate in your purchase or your financing, they do have advantageous lending arrangements available through national lending institutions. If you are going to build a new restaurant, you will need 40% of the investment in cash, and the balance may be financed. If you have never been to Hamburger University, you are in for a treat. McDonald’s has the most extensive training facilities and program in franchising. They even have a hotel on campus: The Hyatt Lodge at McDonald's Campus. Included in the McDonald’s training program is 9 to 18 months working in a restaurant close to your home, coupled with approximately twenty hours per week of self-directed training, seminars, conferences, and one-on-one sessions with McDonald’s operators and instructors. In addition, there will be two advanced training courses at Hamburger University. In most franchise systems it is the responsibility of the franchisee to locate a site that meets the franchisor’s standards and which is then approved by the franchisor for you to develop. McDonald’s is different; it acquires the real estate and constructs the location for you. On the chance that you think you may have the perfect location for a restaurant, McDonald’s is primarily looking for corner locations or locations where they can wrap signage on two major streets. The overall site will be approximately 50,000 sq. feet and be suitable for a 4,000 sq. ft. building with adequate parking for the restaurant. The decision regarding a site that you present to McDonald’s is always kept separate from their consideration of you as a potential franchisee. The number one reason that McDonald’s operates as it does is likely because it communicates with its operators and provides headquarters and field support better than any franchise system. In addition to training and real estate site selection, McDonald’s field support is extensive, as is the level of contact and communication it has with its operators.